Living… in Bluffington, where he just moved with his parents and older sister Judy. It’s a nice suburban town, and evn though Doug is a little shy, he’s ready to learn the ropes of life in Bluffington. Profession… middle school student. Doug is especially good at writing, and letting his imagination run wild. Interests… playing the banjo, journaling, and hanging out with his dog Porkchop and best friend Skeeter. Doug also enjoys imagining himself as the superhero Quailman, who fights crime with his underwear on the outside of his pants. Relationship Status… single, but he has a huge crush on Patty Mayonaise, a sweet and talented classmate. Challenge… trying to be the best he can be. Doug is afraid to fail and he can often get nervous, especially around his bully, Roger Klotz. But, no matter what, Doug always tries his hardest. Personality… introspective, anxious, and kind. Doug can be quiet and a little gullible, which can make it especially difficult to be the new kid in town. But, he is creative and a loyal friend, and these qualities help him find his place. 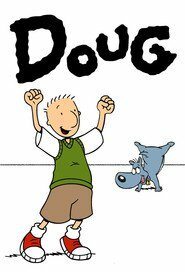 Doug Funnie's popularity ranking on CharacTour is #1873 out of 5,000+ characters. See our top-ranked characters and read their profiles.